Summon: Deal 1 damage to an enemy creature for each friendly Orc. Stoneshard Orc is a rare Strength creature card. It is part of the Madhouse Collection. "You get one shot. Make it good." "Not every card in the set is a wacky homage to the Prince of Madness. We also included some cards to boost existing strategies. We saw an opportunity to give a new twist to the Orc tribe, a deck that has been a bit of an underdog these last few months. Stoneshard Orc provides a targeted removal option for players committed to the Orc strategy. In the right deck, this fellow can immediately take out some of those pesky creatures who like to hang out in cover or behind guards, you probably know the type. 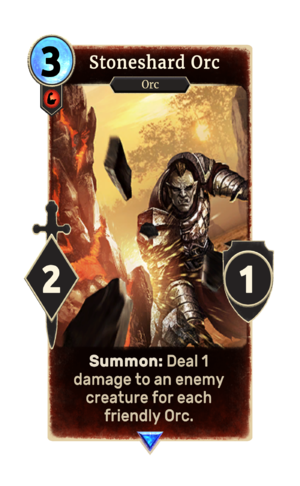 Cards like Bruma Armorer and Markarth Bannerman are prime audience members for Stoneshard Orc's smashing entrance!" This page was last modified on 26 February 2019, at 23:41.